Less assembly than model cars but way more fun!! A child can learn how to create, build and have fun. The Made By Me Box Set allows children the chance to make relatively simple vehicles and then decorate them anyway they like. Better than a preassembled toy in my book. The Made By Me Boxed Set is also one parents don’t really need to help with. I like toys that show children how learning and creating is fun and exciting. Who know’s this might be the spark your child needs to figure out what he or she will want to be when they grow up. Get 4 original vehicle kits in one box. Includes the blank bodies for a train, tugboat, tractor, and truck plus wheels and axles for each. The Made By Me series allows children 3 and up to have a good creative and constructive time! The assembly instructions are enclosed. All you need is some glue, a hammer, and paints, crayons, stickers or anything you want use for designing your vehicles. How fun ist this? You can teach your children or class about recycling paper and actually show them! This is great for a science project or for something to do around the house! Once your kids learn how to do this it can be a practice carried on through their lives to remember the importance of recycling! Green Creativity has amazing products for learning and fun! Learning to be green is great to start when you are young! You can get your Paper Recycling Kit here. Repurpose old paper into new paper with Green Creativity’s Paper Recycling Kit! This kit is designed to help your child understand how paper can be recycled.Learn how paper is made and recycled. Create lots of different textures and patterns and make them into unique bookmarks, notepads, greetings cards and more!Another great educational children’s toy that will help your child learn and care for our environment.Kit Includes: 50g of paper, paper making tray, net, 3 tubs of paint, 1 paint brush, colored yarns, silk flowers, ribbon and detailed instructions. 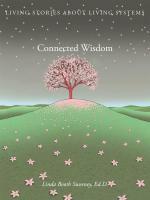 Connected Wisdom Illustrates the inter-connectedness we as a world share. Every action effects your surrounding environment accordingly. This concept may be difficult for children to grasp but Connect Wisdom defines the meaning of a Living System perfectly for everyone in terms that can be come a “fairytale” of positive sorts for generations to come. Everyone agrees that to create responsible and aware adults the lessons must come from childhood where these ideas can be cemented in to a child’s impressionability before they have time to be negatively influenced by outside efforts. This may sound almost like brain washing but if you think about the fairy tales that you remember as a child most of them had little to no relevance to real life other than wait patiently for prince charming to come save you. You grow up being delusional even if you know better somewhere deep down you wish for Prince Charming right? In the case of Connected Wisdom a child can know deep down what is right so as children and then adults they can make good decisions regarding their environments for current and future generations. Living Stories About Living Systems gathers twelve stories from different cultures that each reveal a unique example of a “living system.” Through them, Linda Booth Sweeney shows that what we now call systems thinking has been around for a very long time. A Balinese folktale tells the story of a gecko who cannot sleep because of the sparks from a firefly. He traces the cause of his complaint from one animal to another to the mosquitoes he depends on for his survival. Like this gecko, young readers will understand that all life is inter-related, and will be able to grasp the concept of the living system of “interdependence.” In a Burmese folktale, a king spills a drop of honey on his windowsill, too little to bother cleaning up. Yet the drop draws a fly, which attracts a lizard, which is followed by a cat, then a dog, and the owners of the cat and the dog, each armed with a stick. When civil war erupts, the king and readers understand the living system of “linearity,” in which an effect is disproportionate to its cause. I have written a few posts about Green Toys Inc. products like Green Toys Recycling Truck , Green Toys Tool Set , Green Toys Indoor Gardening Kit , Green Toys BPA-Free Feeding Spoon , & Green Toys Cookware and Dining Set to list a few. I love the packaging and design of these products. They are fun and colorful but more importantly environmentally conscious and made here in the USA! Green Toys Inc. makes sure to minimize packaging where ever they can. As per their site “All Green Toys products are packaged in recycled corrugated boxes with no plastics, cellophane or twist-ties, and are 100% recyclable.” As a consumer this is so important to me. I can’t tell you how many times I buy something and when I open it there is more trash than product. That is just wasteful and makes me rethink purchasing from there again. Green Toys Inc. has their products tested by nationally recognized third-party labs here in the USA to make sure they are fit and up to par with regulations and container no external coatings so lead poisoning is a non-issue. Toys may always be necessary but they don’t have to be harmful. Children are a precious resource and it is our responsibility as adults to teach them at a young age how important it is to be responsible to our environment. We can do this by making conscious purchases. Companies like Green Toys Inc. takes their responsibilities seriously and so should we. All Green Toys products are 100% made in the USA. To be more specific, they are produced in California, a state known for strict toy safety and environmental laws. It’s cool to buy USA, but also think about this: transportation is one of the biggest contributors to greenhouse gasses. We all know driving less is good for mother nature, but did you ever think about how many miles a toy logs before it ends up in your local store? Our toys are truly local creations. Every step in the process, from milk container recycling to toy production to final assembly, occurs in California. Our raw materials and toys aren’t shipped from overseas, which saves a lot of energy and reduces greenhouse gasses. It also guarantees your toys won’t get seasick before they get to your home!